India’s greatest spiritual show, Kumbh Mela, has been declared Intangible Cultural Heritage of Humanity by UNESCO.The decision was taken at the 12th session by UNESCO’s Intergovernmental Committee for the Safeguarding of the Intangible Cultural Heritage in in Jeju, South Korea from 4-9 December.Previously ‘Yoga’ and ‘Nouroz’ were also included in the list. 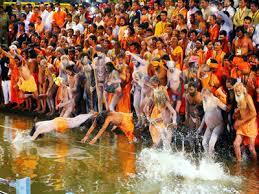 Held in Allahabad, Haridwar, Ujjain and Nasik alternatively, this festival held every four years sees a massive gathering of pilgrims who participate in the ritual cleansing in the holy rivers in India. With its origins in Hindu mythology that tells how a few drops from a pitcher containing the nectar of immortality fell on the four locations across India during a fight between gods and demons, Kumbh Mela is the largest peaceful gathering of pilgrims.